It's the last day of July 206 and time to say Goodbye to July 2016. This July 2016 version was very similar to the last three July's we had on Koh Samui, it was not that great when it came down to the weather. Plenty of rainy days and sometimes some hard wind besides some sunny days as well. July is known for it's mild monsoon season aroud the Samui archipelago and this July was no exception. After having spend a good six weeks at home, this month I found myself most of the time on the road, first for a PADI IDC in Moalboal in the Philippines and after just having been home for a day, I was on my way again to Phuket for the current PADI IDC. The few days I was on Koh Samui during this month, we did manage to visit our favorite Japanese restaurant 'Kobori' in Maenam, the quality is still great and it absolutely comes recommended. After the first week of next month, I should be back on Koh Samui again and I'm looking forward to the busy month of August on and around Koh Samui's shores. See you there and keep dropping by and keep reading my daily weather updates. A statue of a farmer walking his water bufallos, near the Bophud traffic lights. In real life I never saw someone walk three bufallos at the same time, but just the one. I don't think that male buffalos really like each other too much, hence the bufallo fights. I do like the fabric the farmer is wearing around his waist, that's very authentic! The forecast ells us that thw wind will start picking up over Koh Samui and it's archipelago come tomorrow with storm like weather conditions from Wednesday though Friday. Next Sunday the wind should drop and come Tuesday the sun should be out and about again. This storm is going to affect most of Southern Thailand's provinces. The TMD or Thai Metereological Department has issued a weather warning. The sky over Koh Samui looks gorgeous this monring and there has been a bit of a change in weather overnight! Current temp at 7am is 27C and it looks like it will remain nice and sunny today. View from my room in Kata, Phuket from my small balcony. 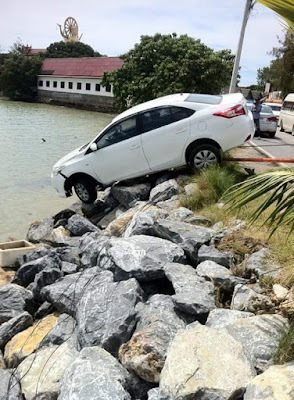 The road is Patak road, the busy 'second' road, connecting Chalong and Rawai with Kata and Karon and what's beyond in both directions. The background is very green with the hills that surround the area here. The forecast has changed drastically overnight, until Monday we should see sunny skies and the cloudy and wind riddled period has now been condensed to a period between Tuesday and Friday. You may still expect heavy clouds, strong wind to storm like conditions and rain on these days but come next weekend, the weather should turn for the better again with more sunhsine and less clouds. The forecast for the next ten days predicts wind until next weekend, the first August weekend with cloudy skies and tropicals showers on a regular base. That first August Sunday may see some relief with the sun coming out again and the wind should have dropped before that weekend. The forecast didn't change much, clouds, strong wind with storm like power at times and plenty of rain starting as of tonight and leading into next weekend, the first August weekend. Yesterday saw another warm day but there was also rain and at some parts there was also some thunderstorm with lightning. Max temp reached 32C nonetheless. The forecast has changed and it's not looking that good now for the enxt ten days, the period with strong wind, even storm, has extended now and starts this Friday and goes on all the way up to next Wednesday. Strong wind, almost storm like at times with plenty of rain after the weekend and once the wind has gone, the clouds and rain may stick around. Not a great way to end the month and start a new one. This same morning, the candidates of the Moalboal July 2016 PADI IDC in the Philippines start their PADI IE. All the best to them. Yesterday saw the sun break through rather early around Koh Samui, after some early morning rain showers. Around 9am it was partially blue skies around the island. Max temp reached 34C, a pretty warm day, especially with the high humidity. Back on Phuket, with the blue Karon ocean in the background at the hilly part between Patong and Karon in front of the Centara Karon Resort or is this actually the Centara Grand Beach Resort? The forecast for Koh Samui has changed a bit since yesterday, for the next ten days it should be paryially cloudy with an occasional shower but come Friday the wind should pick up and come next week Wednesday we may have a real storm blowing over Koh Samui. However, that's still a while away and typcially these storms tend to peter out before they hit the Koh Samui shores. We will keep an eye out on it though and give you daily updates. I'm off to Phuket later this monring and will be there for around two weeks, teaching a PADI IDC on Phuket. The forecast cloudier days ahead as of Wednesday with a strong breeze and tropical showers at times and after next weekend the clouds may break up but the wind intensity may increase. Am back home again, I arrived at 4pm at Samui airport, will be home all day today and tomorrow morning I will drive over to Phuket, to start a PADI IDC there on Tuesday. Yesterday saw a dry around Koh Samui and it was warm when I arrived, although max temp reached just 31C with a few showers around the island at different locations at different times. The forecast for the next ten days predicts a mixture of cloudy skies and partially cloudy skies with occasionally a tropical shower and next week towards the end of the week some wind. Come 16.00 hours I should arrive at Koh Samui airport. Yesterday saw a very nice and sunny day around Koh Samui with a max temp of 33C although there may have been some local showers. My last day at Panagsama beach near Moalboal in the Philippines, this afternoon I will finish the current PADI IDC, an update is to follow and I will be off to Cebu, tomorrow it's back to Koh Samui, via Manila and Bangkok. The small square in front of Eve's Kiosk, the dive resort I stay at in Panagsama Beach near Moalboal in the Philippines. Usually filled with cars in the weekend and quite empty during the week. The forecast is looking good for the next ten days with a mixture of partially cloudy days and days with a bit more sunshine. In general a very good forecast with plenty of sunshine and just an occasional chance of a tropical shower. The forecast for the next ten days is showing a mixture of mostly cloudy skies for the first five days with possibly a tropical shower thrown in for good measure and a lot more sunshine for the second part of a five day period. Wind or breeze should be more or less absent during this period. It's the last day of a very long free weekend for the Thai population because of the Asahna Bucha and Khao Pansa days in 2016. Since both days were on a Tuesday and Wednesday, the Monday became a day off as well and a long weekend was vreated with thousands of Thais and expats enjoying the occasion and taking trips in and outside of Thailand. Koh Samui was busy and with the usual sumer holiday travellers from Europe, the flights and ferries were and are today again chock full. All public offices like schools and banks are closed although banks do open on Khao Pansa day again but our children are still enjoying a day off from school today. Asahna Bucha day or WAN ASANA BUCHA – วันอาสาฬหบูชา is the first full moon of the eighth lunar month (usually in July) and commemorates the Buddha's first sermon in the Deer Park in Benares in India and the founding of the Buddhist sangha (monkhood) about 2,500 years ago. 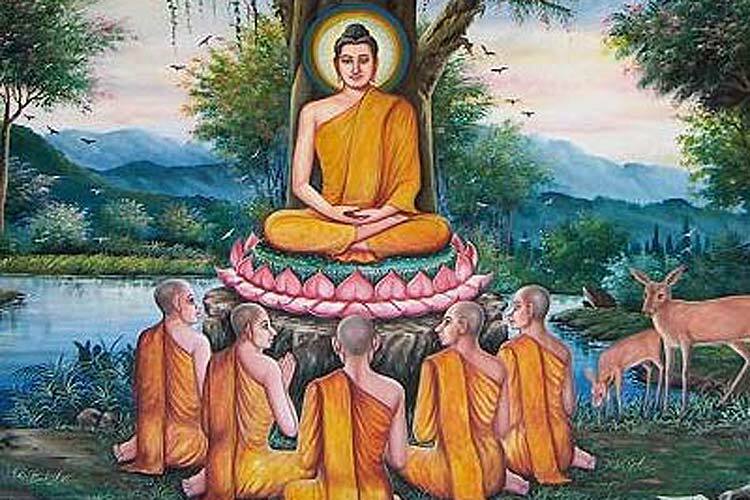 In the sermon, which is known as 'Setting the Wheel of Dhamma in Motion', the Buddha first spelled out the Four Noble Truths and the Noble Eightfold Path. The day marks the beginning of Vassa, the Buddhist lent period also known as the 'Rains Retreat'. This was celebrated yesterday, 19th July 2016. Many Thai people will return to their ancestral homes to worship in their local temple and to bring offerings for the monks. In the evening they will often perform a wien tien, where they walk clockwise around the main shrine of the temple carrying a candle, three incense sticks and a lotus bed. This is done a few times per year at our local Wat Plai Laem or Wat Suwannaram temple. During the day, monks chant mantras or repeat the first sermon of the Buddha. WAN KHAO PANSA – วันเข้าพรรษา or Khao Pansa day Wan Khao Pansa (วันเข้าพรรษา) means the day of entering the rains retreat. This is a three-month annual retreat usually undertaken from July to October, during which monks must stay at the same temple, and refrain from wandering around the countryside. In India, it is known as Vassa. It begins on the day after Asahna Bucha. The tradition dates from the time of the Buddha, when he forbade monks to travel during the rainy season for fear that they might unintentionally harm crops or insects in the places where they walked. In Thailand, monks use the retreat to meditate more intensively. Lay people will often use this period to adopt more ascetic practices, abstaining from meat, alcohol or cigarettes, for example. You can find a lot more vegetarian food being easily available at restaurants during this period (ahaan dcheh). 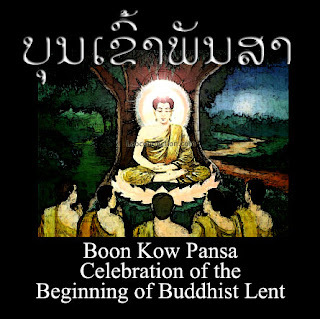 Wan Khao Pansa is often referred to as Buddhist Lent, as its emphases on reflection and self-denial bear outward resemblance to the Christian Lenten period (though pre-dating it by over 500 years). It is also a time when many young Thai men ordain and join the monkhood for part or all of the period of the rains retreat. This is a traditional rite of passage for most young Thai men, and it creates valuable merit for the whole family. The forecast predicts cloudy skies until Friday, that's when sunnier skies should replace the cloudy skies with partially clouded skies to very blue skies, varying from day to day with occasionally a bit of a breeze and very limited tropical showers. Back here at Panagsama beach near Moalboal in the Philippines we started the day once more with an early morning dive, hence we're an hour later than usual with the daily weather update. It's partially clouded here with a current temp at 9am local time of 30.7C and the current PADI IDC is still in ful swing. The forecast is still looking good, fairly cloudy until Friday morning, with more sunshine and partially blue skies coming up from there onwards. Get the sun lotion out and enjoy your time on the beach or around the island. The never boring view from Lantaw restaurant, just above PADI 5* IDC Center 'Neptune Diving Adventure', where I conduct the PADI IDC's at Panagsama beach near Moalboal in the Philippines and where we have lunch every day. Sometimes I go back in the evening to have dinner here as well! The forecast is looking good for the next ten days, partially cloudy with an occasional shower until Friday and from there on even more sunshine and blue skies. Enjoy! The forecast is looking good with a light breeze and partially cloudy skies until Thursday and from there on we should have sunnier skies again. Not much rain is expected during the next ten days. The forecast is looking good, Monday through to Thursday may be a bit cloudy with an occasional tropical shower but all other days in the next ten day period look sunny and nice. Blue Vanilla opens a new shop in Fisherman's Village and it's already the third outlet of Blue Vanilla in Fisherman's Village, with another one at Central Festival in Chaweng and one more Blue Vanilla outlet can be found at Big Buddha. The new outlet in Fisherman's Village has the usual high standard of souvenirs and merchandise that you can expect from the Blue Vanilla crew by now and to top things off, there's also a nice bar, which at a later time may be used to serve alcohol as well. For the time being it will be coffee and juices only and not to forget their homemade cheesecakes. Opening times are from 11am to 11pm, except the shop at Big Buddha, which opens at 8am and closes at 7pm. Friendly service and staff are guaranteed and you will be able to find something different to bring home as a good remembrance to your Koh Samui visit, something that can be funny, cute or nice and is different including Thai food items, that stands out against the usual and standard type of souvenir that you can find almost everywhere else. Have a look at the growing Blue Vanilla emporium and enjoy their ambiance and wide range of souvenirs and tidbits on offer, it's well worth a peek into their shops. Congratulations to Blue Vanilla with another outlet and make sure to drop by. In my opinion Blue Vanilla is a great addition and brings a nice variation to what is on offer on Koh Samui with some original ideas and ambiance. Today's weather update is a bit late since I started the day with a 39 meter deep dive as part of the current July 2016 PADI IDC in Moalboal in the Philippines, which we started yesterday The deep dive was a great way to start the day and all this under a nice and sunny, blue sky. Current temp at 9am local time in Moalboal is 30.3C and the temperature is rising. Mabuhay! The forecast is looking a lot nicer now, we should see a lot more sunshine and blue skies going hand in hand with a decrease in wind, except for Monday and Tuesday, which may be very cloudy with strong wind and rain, but especially after these two days, it should return to very nice weather patterns, with lots of blue skies and sunshine, so time to bring the sunscreens and lotions out again. Relaxing at Choengmon beach with a swing hanging on a tree trunk, there are reasons this beach is our favorite beach on Koh Samui, besides that it's around the corner of where we live. The forecast is is on the up again, less clouds but still with a nice breeze and possibly a very strong wind come Monday and Tuesday but with a lot less rain and at the weekend of 23rd July it should be really nice again and the sun should be out in full force. Enjoy! Today I will start a PADI IDC Staff Instructor course and tomorrow I will start the PADI IDC for July 2016 in Moalboal. The forecast for the next ten days around Koh Samui is looking straightforward, until Frday clouds with a breeze and some tropical showers and as the weekend starts it should be less cloudy or partially cloudy with a breeze and some tropical showers passing by. At last I arrived in Cebu City in the Philippines last night, with a three hour delay, was in bed by around 1am. Very late for my doing nowadays. Later today, early this afternoon, I will move on to Moalboal and start an IDCS course and a PADI IDC there tomorrow. First I'm going for a 10km run though! The forecast hasn't changed much, cloudy, a nice breeze and an occasional tropical shower until the weekend. Over the weekend the sun may break out again with some cloudy days after the weekend again but more sunshine towards the next weekend. Today will be a long travel day, my flight to Bangkok has been delayed for an hour already though but I won't arrive in Cebu in the Philippines until 9.30pm tonight. The forecast for the next ten days predicts cloudy and windy days with an occasional shower until next weekend, after the which the sun may return.